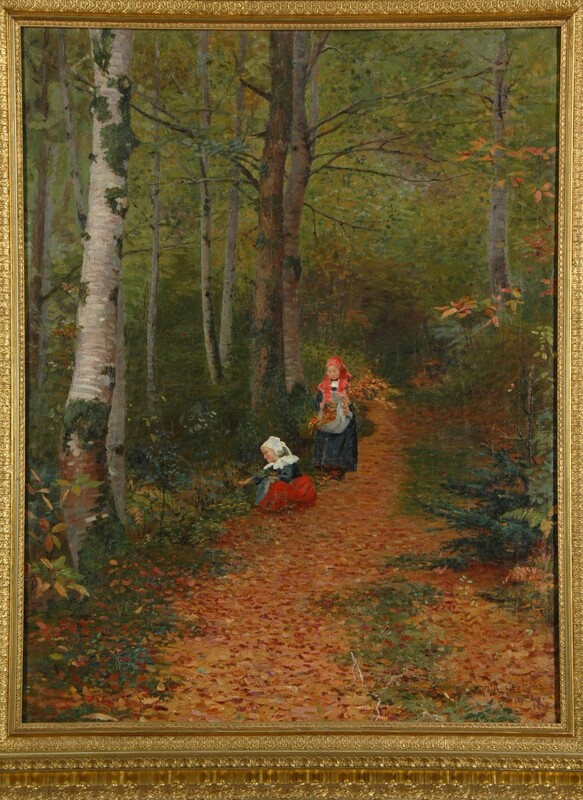 Autumn Leaves depicts two children in Breton dress walking amid pristine natural surroundings. A well-worn path promises their safe passage through the forest. Like Paul Gauguin after him, Paul Peel revelled in the evidence of traditional French culture that could be found in Pont Aven, a small community located approximately 500 km southwest of Paris. Between about 1830 and 1900, Pont Aven attracted American and Canadian artists as well as artists from Britain and Continental Europe. For some, it was a chance to rebel against the Academic way of painting taught at the École Nationale des Beaux-arts in Paris and heralded by the Paris Salon. For others, like Peel, it was an opportunity to continue honing artistic skills that were in concert with prevailing art traditions. Peel returned to Pont Aven several times during the 1880s, meeting his future wife there in 1884 and fellow Canadian painter William E. Atkinson in 1889. By about 1890, Pont Aven began suffering from its own popularity, becoming crowded and less attractive to its artistic visitors.